The Information tab shows detailed information about the selected player, their games, results, performance and favourite openings. This dialog is a very powerful navigation aid for chess players so we will try to explain it in detail. If you have a game open in the Game Notation pane with the player you are interested in you can click the player name to access this Player information directly. Players name, in the included databases we use the official FIDE names where available. Now we come to the player statistics. The statistics marked in blue are selectable and clicking them will automatically populate the Game Explorer game list with the games matching the criteria, for example clicking on the +155 games in the White: line will show the 155 white wins by Michael Adams in the game list. This innovative hyper-linked connectivity between Players and Games is a very powerful and convenient mechanism to rapidly access games. Total games played split into wins, draws and losses. Opening statistics show the 8 most popular openings the player played with the White and Black pieces. Press the [More...] hyper-link to see more openings. 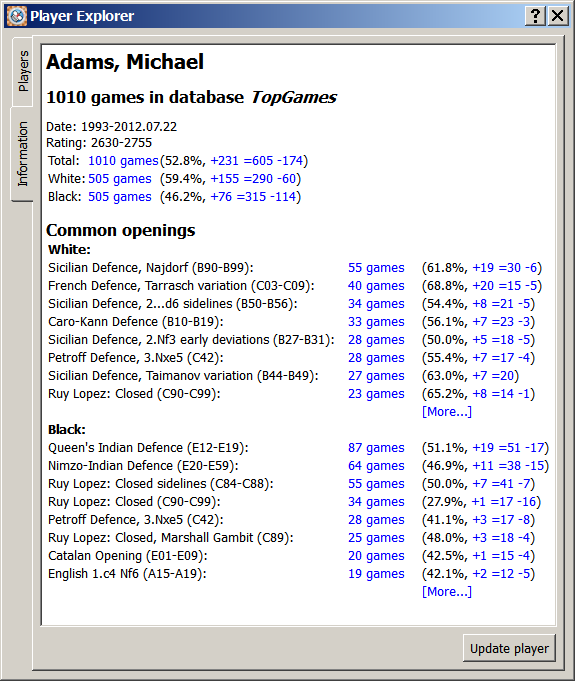 Under the player's opening statistics section you can again click any statistic marked in blue to populate the Game Explorer game list with the games matching the criteria, for example clicking on the 54 games next to Sicilian Defence, Najdorf will show those games involving Michael Adams where the Sicilian Nadjorf opening was played. This innovative hyper-linked connectivity between Players, Openings and Games is a very powerful and convenient mechanism to rapidly access games in particular openings. The opening statistics are particularly useful if you are interested in a particular opening or a particular player and the openings they play. This is very useful for preparation. Here you can see the overall statistics including wins, draws, losses and unfinished games. The opening statistics are very interesting and cover the whole database showing the 20 most popular openings for white or black. 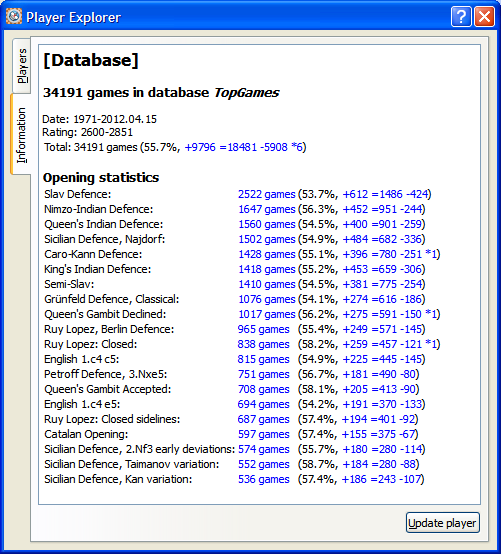 You can click any hypertext in blue and HIARCS Chess Explorer will populate the Game Explorer game list with the games matching the criteria,for example clicking the +274 on the Grunfled Defence Classical line will show all the white wins in the Classical Grunfeld opening in the game list. This innovative feature gives a powerful instant connection between Players, Openings and Games and a convenient mechanism to rapidly access games in particular openings. The Update list button can be used to update the statistics if you have added, modified or deleted any games to this database since the Player Explorer dialog was opened.